London has one of the most extensive, dense and efficient transport networks in the world, comprising buses and trams, both underground and over-ground rail system, road, cycling, river and canal transport systems. The domain of transport is a cardinal element amongst the four components of policy administered by the mayor of London, though this does not include long distance rail network which enter London. The mayor takes responsibility for the London underground rail network (Tube), some part of the London over-ground rail network, trams and buses. The public transport network is administered by the Transport for London (TfL). 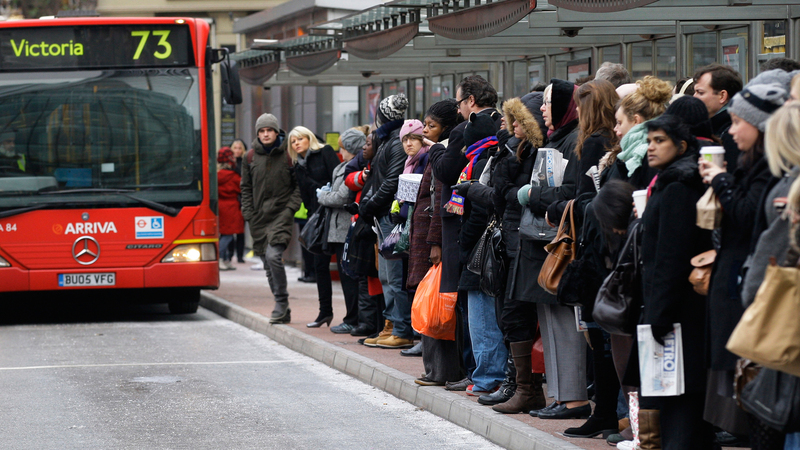 London has one of the most extensive and densest bus networks in the world, which operates non-stop for twenty-four hours. The London bus network has about 8.000 buses, 700 bus routes and approximately 6 million passenger journeys are made every day of the week. In the year 2003, the network was served by an estimated 1.5 billion passengers. London also has the largest wheelchair accessible network in the world, including accessible hearing and visually impaired passengers, following the introduction of audio-visual announcements. The distinctive red double-decker bus is a hallmark for transport in London, as are the black or London cabs and the underground rail or Tube. London has an innovative tram network known as Tramlink, which is based in Croydon, South London. The London tram network has 39 stops, three routes; and served about 26.5 million people in 2008. In London, cycling is a means of transport that is quite commonly in use. This field of public transport has enjoyed a major revival since the dawning of the Millennium. A scheme known as the Barclay Cycle Hire was launched in July 2012, to scale up the effectiveness and the efficiency of cycling as a mode of transport. This comprises the London underground (Tube) and the London over-ground. The London underground is the world’s oldest and largest rapid transit system. The London underground system provides service to 270 stations, serving about 3 million passengers each day; which tallies to 1 billion passengers being served each year. The Docklands Light Railway (DLR) went operational in 1987; and it’s the second more local metro system that uses lighter tram-like vehicles, which serve Docklands and Greenwich. There is equally an extensive surface railway network, most prominently in South London, which has fewer underground lines. London boosts Britain’s busiest railway station known as the Waterloo station, with over 184 million people using the interchange station complex each year. The station serves as a major rail hub for services to South-East and South-West London, including parts of South-East and South-West England. A majority of the rail lines terminate in the area of Central London, making their way into the eighteen terminal stations; with the exception of the Thamelink trains that connect Bedford in the north and Brighton in the South via Luton and Gatwick airports. There are now high-speed Eurostar trains connecting St Pancras International with Lille, Paris and Brussels. The duration of the journey to Paris is 2 hours 15 minutes and to Brussels is 1 hour 50 minutes. London also has an efficient and dense road network system. Travel by vehicle is particularly common in the suburbs. The city of London is encircled by the inner ring road (around the city), the North and South Circular roads (in the suburbs) and the outer orbital motorway (the M25). These roads are intersected by a number of busy radial routes, while very few motorways penetrate into the city of London itself. London is notorious for traffic jam, with the M25 motorway being the busiest road in the entire nation. The average speed of a car in the rush hour is 10.6 mph (17.1 km/h). In 2003, the government introduced a congestion charge, in an effort to curb hectic traffic in the city of London. With the exception of a few cases, motorists are expected to pay £10 per day to drive within a defined zone encompassing much of congested Central London. London’s local government initially anticipated the Congestion Charge Zone to increase daily peak period underground rail and bus users by 20,000 people, reduce traffic by 10 to 15 percent, increase traffic speeds by 10 to 15 percent, and reduce queues by 20 to 30 percent.